When the SMS notification from OCBC was shown on my mobile phone on 1 April, I would have thought that this is one of the wacky pranks among other creative April Fools' Day gimmicks. This is especially so when OCBC has recently revised the interest rate for 360 Account on 1 Nov 2018, merely 6 months ago. It was subsequently confirmed that this favourable news is here to stay and is now a permanent feature of the OCBC 360 account until further notice. With that, this article aims to find out the additional amount of interest an account holder can expect to earn, as well as to compare across different methods to fully utilise the step-up bonus. You may wish to refer to the OCBC website for more information. From 1 April, the Salary Bonus interest for balances between $35,000 and $70,000 has been increased from 1.5% to 2% per year. Account holders can still earn 1.2% interest on the first $35,000 and the minimum salary crediting amount has remained unaltered at $2,000. On the whole, the effective interest rate on $70,000 balance contributed by the category of Salary Bonus has raised from 1.35% to 1.6%. For ease of comparison, let's consider the scenario in which the salary, spend and step-up bonus of OCBC 360 Account are fulfilled. Graphically, we can observe that the revision provides a significant interest rate increment beyond $35,000 balance. At the maximum account balance of $70,000, the account holder can earn an effective interest rate of 2.55%, translating to a gain of 0.25% or $175 per year. Of course one might argue that the maintenance of step-up bonus can be demanding and some would prefer the flexibility of channelling the excess funds for better use. If the salary credited was promptly transferred out of the savings account, the step-up bonus would be unaccomplished. In such situation, the revised effective rate can reach 2.1% instead of the current 1.85% at $70,000 balance, an absolute gain of 0.25%. As this amendment only affects the second balance tier, it would only benefit account holders who have parked more than $35,000 in their accounts. 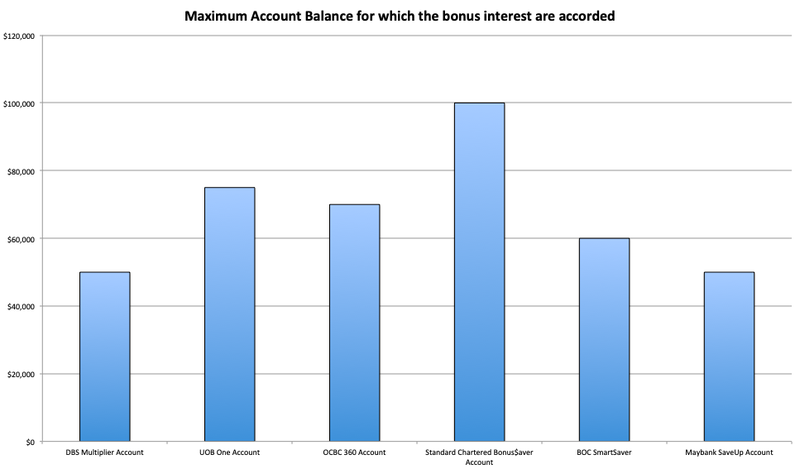 In the previous post regarding the revision of interest rate for OCBC 360 Account, I have examined a hack to perpetuate the step-up bonus chiefly by utilising the mechanism of daily average balance ("ADB"). However, I understand that such method may not be as sustainable as expected due to the increasing sum to deposit in the account. To remove the complexities from the equation, we can narrow down to the few approaches illustrated in the table below. For ease of comparison, we assume the profile of an account holder who is able to fulfill the salary and spend bonus. To simplify the calculation for step-up bonus, he can choose to deposit $500 at the start of the month and transfer out his salary credited within the same day. This will help to maintain an incremental ADB of $500 that is easier to keep track of. In order to sustain the annual cycle, the account balance will be reset in Month 1. Thus, the step-up bonus for that month will be unqualified. The interests are computed using the calculator available on the OCBC website. The account holder does not intend to have excess savings beyond $70,000 and therefore only maintain the maximum balance of $70,000 for which the bonus interest is accorded. As calculated above, he will earn an effective interest rate of 2.10% and total interest of $1,498. The account holder starts with a balance of $64,500 and increases it by $500 per month. The effective interest rate that he is able to earn has jumped to 2.49% with the total interest calculated to be $1,708.57. Similar to Method 2, the account holder starts with a balance of $70,000 instead to maximise the interest earned. Subsequently, he increases the balance by $500 each month. The effective interest rate that he is able to earn is 2.43% with the total interest at $1,798.33. Beyond $70,000, the account holder has intended to recycle $500 only, which he faithfully deposits and withdraws on alternate months. The interest earned at $1,661.22 is still higher than that from Method 1. To sum up the comparison, it would appear that Method 3 reaps the highest interest but falls marginally behind Method 2 in terms of effective interest rate. Regardless, it would seem sensible to not overlook the significance of step-up bonus. This equates to an additional $300 interest that an account holder can earn in a year if he were to employ Method 3 instead of Method 1. Following from the previous post on the comparison among the active savings accounts, let's see where OCBC 360 account stands with the latest revision to its salary bonus. As a disclaimer, I have cheated a little and included Citi MaxiGain Account as one of the contenders. This is because the MaxiGain account offers competitive interest rate which rivals that of the other active savings accounts despite being a passive savings account. With the addition of a new candidate, the OCBC 360 Account has been shifted to 4th placing in terms of maximum balance for which the bonus interest is accorded. The Citi MaxiGain Account leads the pack at $150,000, followed by Standard Chartered Bonus$aver Account ($100,000) and UOB One Account ($75,000). According to the ABS website, the 1-Month SIBOR is currently at 1.82283. Therefore, the Citi MaxiGain Account currently offers the best bang for the buck at 2.48% with a few caveats such as the building up of 12 counters (represented by the orange bar) and a balance of at least $70,000. Additionally, its effective interest rate is subjected to the fluctuation of SIBOR. For the sake of comparison, the Method 3 depicted above is being used as a benchmark for the computation of effective interest rate for OCBC 360 Account. With the boost from the salary bonus increment, the OCBC 360 Account has sharpened its competitive edge and is now almost on par with UOB One Account. If we were to judge solely on the prerequisite of salary crediting of at least $2,500, the OCBC 360 offers the 2nd highest interest rate at 1.6%, behind DBS Multiplier at 1.85% (considering the credit card spending of $1 to be negligible). Merging the information from the first 2 charts, we can measure the maximum bonus interest that one can potentially earn from these savings accounts. Needless to say, Citi MaxiGain Account and the Standard Chartered Bonus$aver Account have clinched the first 2 positions, attributed to their impressively high cap on the balance that earns the additional interest. The UOB One Account still has a slight advantage over OCBC 360 Account due to its marginally higher balance cap of $75,000. Although it is still far from its generous 3.05% interest rate back in 2014, I must say OCBC has made a decent move in closing on the gap among its peers. If you do not wish to miss out on any articles, you may consider following the facebook page for timely update. Disclaimer: Kindly note that this is not a sponsored post. The author is in no way affiliated with the stated financial institution and does not receive any form of remuneration for this post. The Boy who Procrastinates has compiled the information for his own reference, with the hope that it will benefit others as well. This quote came from Senator Bernie Sanders when he introduced a bill to break up America's largest financial institutions in 2018. The rationale is that if a financial institution is too big to fail, it is too risky to allow it to exist as its failure would cause catastrophic risk to the economy. In order to ensure the stability of the banking system in Singapore, the Singapore Deposit Insurance Corporation (SDIC) was incorporated in 2006 to administer the Deposit Insurance Scheme and Policy Owners' Protection Scheme, as well as to manage the underlying funds. Starting from today (1 April), depositors and insurance policy owners will be able to enjoy enhanced protection in the event that their financial institution fails. This article will provide an overview of the 2 Schemes as well as address the recent revision made. First launched in April 2006, the DI scheme is designed to safeguard the core savings of small depositors, net of liabilities, in the event that their bank or finance company fails. Unless exempted by MAS, all banks and finance companies in Singapore are members of the DI scheme. These members pay annual premium contributions to a Deposit Insurance Fund (DI Fund). In the unfortunate event that a financial institution fails, the scheme compensates the affected depositors through the DI Fund. When the DI Scheme was first launched in 2006, depositors of a failed financial institution were insured up to $20,000 of their Singapore dollar deposits only. This limit was subsequently raised to $50,000 in May 2011. However, the percentage of fully-covered insured depositors has eventually reduced to 87% over time due to rising incomes and greater savings. In order to restore this ratio to above 90%, the DI coverage limit has increased by 50%, to $75,000 from 1 April. The bank deposits in Singapore are insured up to a maximum of $75,000 for every depositor per financial institution. This is regardless of the number of savings accounts that one has with the bank. However, there are a few scenarios in which the total sum insured may differ. Deposits held in a savings account, fixed deposit account, current account, Wadiah account, Murabaha account and SRS account are aggregated and insured for up to $75,000. In the example above, Person A has a total account balance of $115,000 across all 3 accounts in Bank X, but the total sum insured is only $75,000. Deposits placed under CPF Investment Scheme and CPF Retirement Sum Scheme are aggregated and separately insured for up to $75,000. That is to say that Person A will be able to enjoy a total insurance sum of $150,000 across his savings account and CPFIS account in Bank X. For deposit in joint account, each joint account holder is assumed to have an equal share in the account, unless stated otherwise. Each joint account holder's share of the joint account is combined with other insured deposits held in his own name. Assuming that Person A has $50,000 in his savings account and $100,000 in a joint account with his spouse in Bank X. His share of the joint account is calculated to be $50,000 ($100,000 / 2). This amount is combined with $50,000 in his savings account to form the total balance of $100,000 but only $75,000 is insured. For sole proprietor, the deposits in his personal savings account will be combined with the firm's account to form the maximum sum insured of $75,000. Trust accounts are insured on a per account basis without aggregation. Suppose that Person A has set up a savings account for his son with $100,000 with Bank X and the same for his daughter. 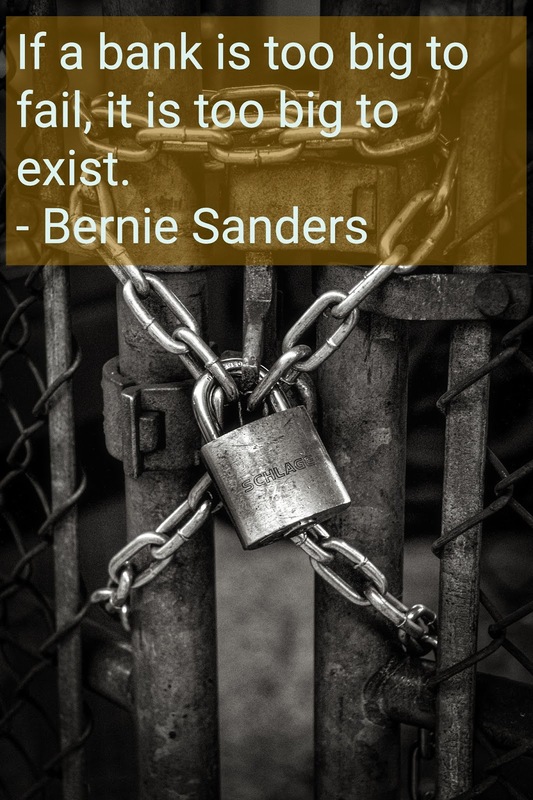 Personally, he has a savings account of $100,000 with Bank X. In the event that Bank X has failed, the total sum insured will be $225,000. Similar to the DI Scheme, the PPF Scheme protects policy owners in the event that a life or general insurer fails. All insurers registered by MAS to carry on direct life business or direct general business are members of the PPF Scheme. They are required to pay annual levies to the PPF Life Fund and PPF General Fund which will be used for compensation to policy owners in the unfortunate event of a failure of a PPF Scheme member. It is imperative to note that life insurance policies issued by overseas branches of a registered life insurer incorporated in Singapore are not covered by PPF Scheme. From 1 April, motor and property insurance policies will be covered even if the car or property is used for commercial purposes. This revision comes at the expansion of the gig economy when more people are using their own cars or homes to generate income. Additionally, there will be caps for own property damage motor claims of $50,000 under personal motor insurance policies and property damage claims of $300,000 under personal property insurance, on a per policy basis. Even though a decade has passed, the collapse of Lehman Brothers and AIG bailout in 2008 may still linger in some of our minds. It has served as a stark reminder that the failure of a financial institution is not completely inconceivable. While such event might be improbable, the enhancement made to the deposit insurance scheme is definitely a desirable revision that helps to boost the confidence of depositors in Singapore. Nevertheless, this recent improvement is likely to have limited effect on the decision to concentrate my deposit in high-yielding savings accounts that allow maximum balance amount which the bonus interest rate applies, to be greater than $75,000. E.g. Standard Chartered Bonus$aver Account ($100,000) and Citi MaxiGain Account ($150,000). Disclaimer: Kindly note that this is not a sponsored post. The author is in no way affiliated with the stated institution and does not receive any form of remuneration for this post. The Boy who Procrastinates has compiled the information for his own reference, with the hope that it will benefit others as well. 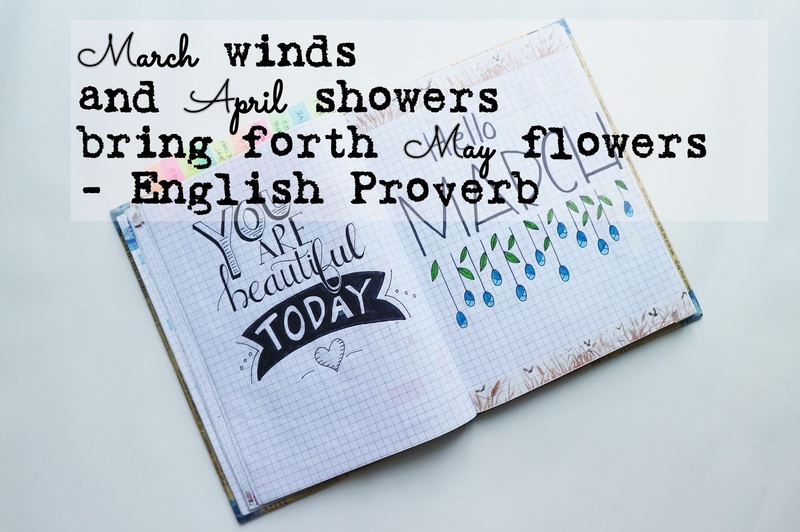 With a blink of an eye, we have zoomed past the first quarter of the year. One of the significant events that have taken place thus far would include the Trump-Kim summit that has occurred for the second time in Feb 2019. The meeting was however cut short with no agreement reached. The US Fed has recently indicated on 20 March that the interest rate will be held steady with no rate hike this year, putting the range of fed fund rate at 2.25% to 2.5%. Even though it may have been a welcoming reprieve for investors in the REITS market, the Fed has signalled signs of weakening economic activity and global growth uncertainty. In the local context, the STI has surged from 3038.89 at the start of the year to 3212.88 in March, ending the first quarter with a rise of 5.73%. Similarly, the SGX S-REIT 20 Index has been on a steady rise from 1212.436 in January to 1346.046 in March, recording a gain of 11.02% in just three months. It has been a dull quarter for me as I have not taken any action to load up on any stocks. In Feb, I have accepted the general offer for M1 which I have elaborated in greater depth in the previous post. Though it does not occupy a significant proportion of the portfolio, it is nevertheless the first loss-making position that I have closed. The off-loading of M1 has been indicated by a different colour ⎼ red to represent capital outflow from the portfolio. This should provide a clearer picture on the movement of the portfolio value. The first quarter has been marked with preponderance of positive sentiment in market's favour. Despite the divestment of M1 and the lack of capital injection, I am thankful that the market value of my portfolio has increased by 1.97% to $102,001.54 in the first three months of 2019. Against the backdrop of STI ETF's YTD time-weighted return of 3.14%, the portfolio has returned 7.43%, a margin of 4.29%. I am rather pleased with the dividend collected so far, largely contributed by the collection in the month of March. 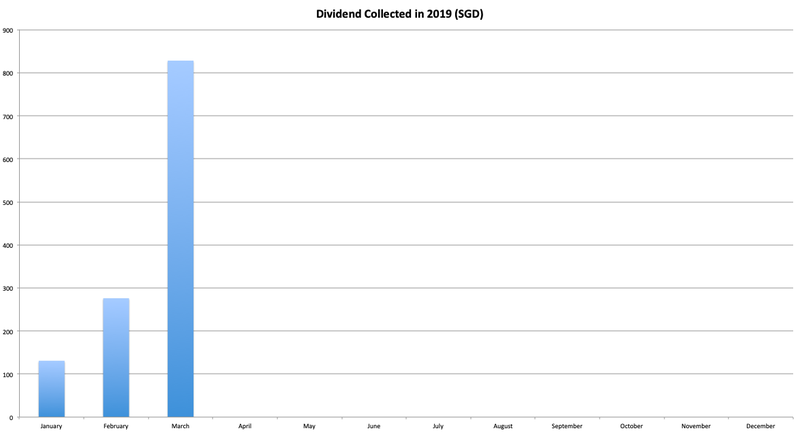 Compared to 1Q2018, the dividend collected has increased by 1,353% to $1,235.21, mainly due to the result of capital injection into stocks and reits last year. First launched in 2016, Maybank will be revising the terms and conditions on the Maybank SaveUp Account for the second time with effect from 1 April 2019. This article aims to provide an overview of the upcoming changes and whether the existing account holders stand to benefit from the revision. You may also wish to refer to the revised Terms and Conditions and FAQ for more information. Before examining the upcoming revision to the Maybank SaveUp Account, it is probably beneficial to have a good understanding and recap to its current interest rate mechanism. For ease of reference, I will briefly summarize on how an account holder can earn interest with this savings account. Base Interest: It is awarded according to the different balance tiers. Other than the minimum daily average balance of $1,000 (to avoid the fall below fee), there is no other requirement imposed to earn the base interest. Bonus Interest: The account holder receives bonus interest based on the number of qualifying products taken up. The huge jump in the bonus interest (1.95%) comes from satisfying the 3rd prerequisite. There are a total of 9 qualifying products. The conventional categories are the crediting of salary, GIRO transaction and credit card spending while the remaining 6 products involve loans, unit trust or insurance. The maximum account balance that earns the bonus interest is capped at first $60,000. Therefore, the total interest an account holder can expect to earn on the Maybank SaveUp Account is the sum of the base interest and the bonus interest. Currently, the Maybank SaveUp Account offers the best bang for the buck among the active savings accounts, at approximately 3% for the first $60,000 balance. This is taking into assumption that the account holder is able to fulfill 3 qualifying products. The maximum account balance that can earn the bonus interest will be revised to the first $50,000. This is a distasteful revision as the maximum amount of bonus interest one can earn will be scaled down considerably. Any balance above $50,000 will now earn the paltry base interest of 0.3125% only. As such, it probably does not make sense to have any amount beyond the first $50,000 in the savings account. Meeting the requirements of either/both of the services of GIRO and Salary Crediting will now be considered as 1 Qualifying Product. Now, this is definitely a deal-breaker! Merging the only few attainable criteria into one is most certainly an off-putting revision for most of the account holders. With the plummet of bonus interest rate from the dissatisfaction of the 3rd qualifying product, the Maybank SaveUp Account will likely lose its allure as a high-yielding savings account. Structured Deposits will be replacing Unit Trust Regular Subscription Plan as a Qualifying Product. There is a minimum investment amount of at least $30,000 and the reward period is 3 months. This change would probably not be affecting the masses unless you are relying on Unit Trust Subscription Plan as one of your qualifying products. In any case, it may be unwise to initiate a structured deposit placement for the sole purpose of achieving high interest on the SaveUp Account for 3 months. All loan and life insurance will earn bonus interest for 12 months following the month of loan disbursement / policy inception. This revision certainly spells bad news for account holders who have taken loan or purchased insurance from Maybank (e.g. mortgage/education/car/renovation loan). For existing loan/insurance arrangement, they will continue to be eligible as qualifying products until 31 March 2020. Purchasing new insurance or applying for new loan just to earn the bonus interest is definitely imprudent since these are long-term commitments. In addition, Maybank will be introducing the revised Maybank Privilege SaveUp Programme concurrently from 1 April 2019. The targeted group will be Maybank Privilege customers with the SaveUp Account. You may also wish to refer to the revised Terms and Conditions and FAQ for more information. According to Maybank's website, the eligibility to become a Maybank Privilege customer is to have at least $50,000 of deposits/investments. Similar to the regular SaveUp Account, the Privilege version offers the same base interest rate according to balance tiers and bonus interest rate based on the number of qualifying products taken up. However, the maximum account balance that can earn the bonus interest will be revised to the first $100,000. As illustrated, the salary crediting/GIRO and credit card spending would require a greater transaction amount in order to satisfy as qualifying products. Interestingly, there is a new category to maintain an average daily balance of $200,000 per month. However, with this being a princely sum, it can come as an arduous challenge for most account holders. Furthermore, even if you have such fortune at your disposal, it begs the question: Is it worth it to deposit in the SaveUp Account? If the Privilege SaveUp Programme does not address your needs, you may request to opt out of it and remain with the regular SaveUp Account. The table summarizes the 3 main areas of alteration made to the savings account. All in all, it is apparent that all these changes are unwelcome and would be detrimental to the interests of the account holders. Personally, I find these negative changes appalling (especially the merging of GIRO transaction and salary crediting into 1 qualifying product) which may cause Maybank to lose its competitive edge and appeal in the domain of bank deposits. For account holders who have existing loan/insurance arrangement with Maybank, they will still be able to enjoy 3% effective interest rate on the first $50,000 which is relatively substantial if you ask me. The reasonable course of action for them is to enjoy the bonus interest for a year before looking out for better alternative. If you are not tied down by such arrangement, the steep decline in effective interest rate is probably a strong justification to start looking out for better substitute. Neither the revised SaveUp Account nor the Privilege SaveUp Programme is as rewarding as the other savings products that are being offered on the market. 1 April may be a cue to switch to a high-yielding active savings accounts or passive savings accounts. Let's assume the profile of an account holder who credits his salary to the Maybank SaveUp Account, performs GIRO transaction and achieves the required credit card spending. Like most people, he does not have an existing loan/insurance arrangement and has no intention of doing so. Graphically, it is evident that the revision of the terms and conditions for the savings account creates an unfavourable situation for this average account holder. The revised effective interest rate has plunged approximately 1.95% as he can only fulfill 2 criteria instead of 3. From 1 April onwards, he will be reaping approximately 1.05% for the first $50,000. If he has opted for the Privilege SaveUp Programme and increased his credit card spending and GIRO transaction, he would still be earning 1.08% on the first $100,000. Even if he has managed to accumulate $200,000 balance, the effective interest rate only peaks at a meagre 1.38%. Following from the previous post on the comparison on active savings accounts, let's see where does Maybank SaveUp Account stand with the upcoming revision. With a 16.67% decline in the maximum account balance for which the bonus interest is accorded, the Maybank SaveUp Account has dropped to the last place in this segment, tied with DBS Multiplier Account. Comparatively, It is lagging far behind Standard Chartered Bonus$aver Account ($100,000) and UOB One Account ($75,000). With the dissatisfaction of the 3rd qualifying product, the effective interest rate that one can expect to earn on Maybank SaveUp Account has taken a nosedive to 1.05%, fallen far behind that of its peers on the chart. Currently, you can get your money's worth with UOB One Account at 2.44% effective interest rate. OCBC 360 Account is the runner-up at 2.3% but with the sustainability of the Step-Up Bonus a cause for concern. 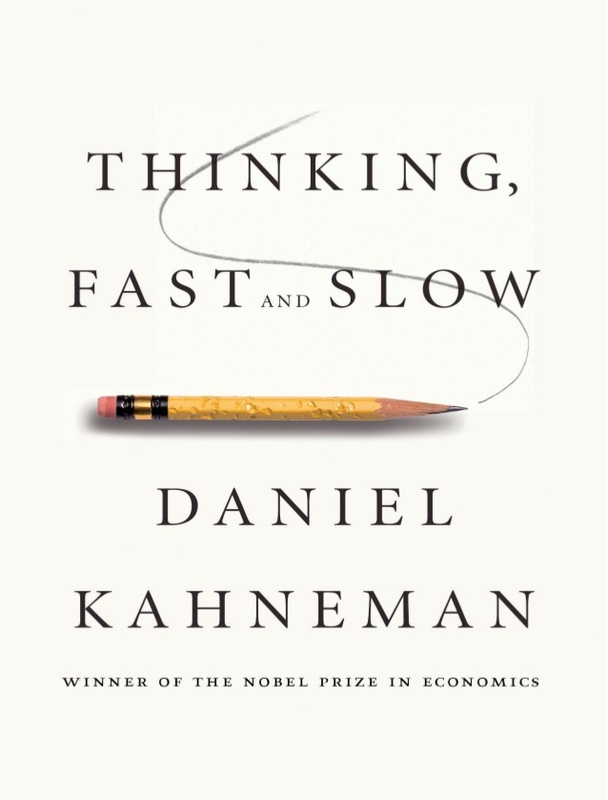 In my earlier post, I have shared a book review on Thinking, Fast and Slow by Daniel Kahneman, chiefly on the subject of Anchoring Effect and its application on the financial decisions we make on a daily basis. Picking up where I left off, I will be focusing on one of the fundamental concepts of behaviorial economics introduced in the book. The prospect theory was developed by psychologists, Daniel Kahneman and the late Amos Tversky, as a theory of decision-making under conditions of risk and uncertainty. It runs contrary to the normative implications inherent in the classical theory of expected utility by mathematician Daniel Bernoulli (even though he has used the St. Petersburg paradox to demonstrate the limitation of expected value as standard decision rule). Instead, the prospect theory presents a more psychologically accurate model of human decision-making. It posits that (1) people make choices by framing around a reference point and that (2) people tend to overweight losses with respect to comparable gains and respond to the probabilities of such outcomes in a nonlinear fashion. Problem 1: Which option will you choose? Despite both options having the same expected utility, most people are likely to be risk averse and choose to receive the $900 for sure. This is because we tend to overweigh options that are certain and hence, adopt a risk adverse attitude towards gains. For example, awarding $120 cashback after charging $400 to a credit card might be a more appealing and effective marketing tactic than having a chance to win $150 after spending the equivalent amount. But how will our choice differ if we construct the problem in the negative domain? Problem 2: Which option will you choose? If you are like most other people, you will probably choose to gamble in this scenario. The certain loss of $900 is very aversive and this drives people to be risk-seeking in the realm of losses. Fundamentally, the contrasting attitudes towards risk with favourable and unfavourable prospects depends largely on the way we frame outcomes as gains or losses. You might have guessed it. Majority of the respondents preferred to receive $500 for sure in Problem 3 and accept the gamble to lose $1,000 in Problem 4. Even though the final states of wealth are identical in both scenarios, the comparison between them underscores the dominant role of a reference point from which the options are evaluated. The reference point of Problem 1 is higher than the current wealth by $1,000, and it is considered a gain of $500 if you were to increase your wealth by $1,500. Conversely, the reference point for Problem 2 is higher than the current wealth by $2,000 and increasing your wealth by $1,500 is considered a loss of $500. Therefore, an individual views monetary consequences in terms of changes from a neutral reference point. For financial outcomes, the common reference point is the status quo. For most investors, the entry prices at which they have taken position for their investment may be a reference point. In other situations, it can be the outcome that you have expected or feel entitled to, for example the increment or bonus that your colleagues receive. Outcomes that are better than the reference point are considered gains and consequently outcomes below the reference point are losses. One basic tenet of the prospect theory is loss aversion. It reflects a prevalent avoidance behaviour involving choices that could lead to losses. To most people, losses loom larger than gains when weighted against each other, resulting in an asymmetrical impact in our decision-making process. Many of the choices that we frequently come across are presented as an ambivalent shade of grey instead of a strictly dichromatic palette of black and white. There is a risk of loss and an opportunity for gain. Such scenarios with the element of mixed prospect can range from an investor evaluating the feasibility of investing in a company to the strategy employed in a soccer match. Problem 5: You are offered a gamble on the toss of a coin. Would you accept it? Even though the expected value of the gamble is positive (an individual stands to gain more than he can lose), most people are likely to reject the game. This is because the fear of losing $100 is more intense than the hope of winning $150. For most of us, the amount we could possibly win has to be at least twice as large as the amount we could lose before we are willing to accept the gamble. Interestingly, our sensitivities to losses can be traced back to evolutionary history in which organisms that initiated urgent action in response to threats as compared to opportunities, have a better chance of survival and procreation. As such, it would make sense that we experience greater pain of loss than joy of gain of comparable magnitude. The prospect theory is one of the most influential concepts in behavioral economics which sheds light on the way we react to gains and losses. In most cases, people might be daunted and discouraged by the fear of making losses. This ultimately drive them to procrastinate or even abandon the idea of taking the first step to investing, even though they might be giving up on opportunities to earn more. Understanding the psychology of gains and losses may be a primary move to overcome our fear when it comes to investing. Disclaimer: Kindly note that this is not a sponsored post. The author is in no way affiliated with the publisher/author and does not receive any form of remuneration for this post. The Boy who Procrastinates has compiled the information for his own reference, with the hope that it will benefit others as well.